I am a huge fan of rescue clubs. Huge. Over-the-top ridiculous fan of rescue clubs. Why do you think that is? Because I'm consistently using them to try and finesse one up to the apron of the green on my second shot on the par 5? Uh, no. I love rescue clubs because I am in constant need of... rescuing. That's right. I'm not a scratch golfer; I'm the golfer who hits his shot and then scratches his head. What the heck did I do wrong THAT time? Second shot -- well over 250 left the green -- can't hit my 3 wood to save my life -- Rescue! 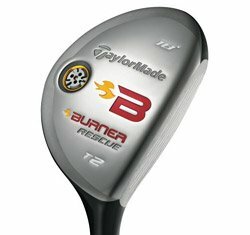 This review targets the TaylorMade Burner Tour Rescue Hybrid Club. Whew! Long name. Good product. Let me start by saying that I actually own one of these clubs. I really use this club frequently, and it currently takes second place in my bag as the dirtiest club I own. First place is actually my putter, because it gets thrown down on the ground so much. And into the sand. And I stomped on it once. Okay, twice. Here's the tech stuff: Lower center of gravity. Dual crown that weighs less than a typical crown. 110cc Burner head that doesn't intimidate. It gets the ball up there, folks, it really does. Mine's a stiff shaft, but it also comes in x-stiff (closest to steel I believe) and regular -- for those who are lucky enough to swing slower.